Griffith's Plum Yew, is a coniferous shub or small tree which is at present under threat. It is a gymnosperm - a plant that bears naked seeds (i. e., seeds not inclosed in an ovary), as the common pine and hemlock. It is endemic to northern India, specifically in the Mishmi Hills of Assam (at about 2000 m) where it is a small tree 15-30 ft tall. It is also found in western Sichuan, China. Needles are 2-3 inches long by 3 mm wide. Plum Yews are slow-growing conifers with dark olive to black-green foliage. Because their habits range from upright and shrubby to low and informally mounding, they can serve as hedges, masses, groundcovers, specimens and foundation or container plants. 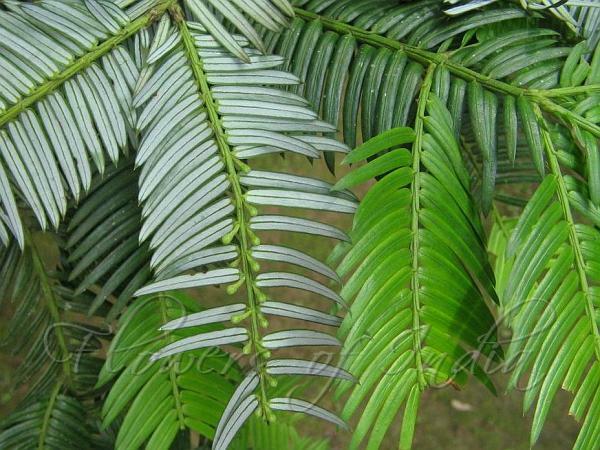 Plum yew's botanical name is apt. 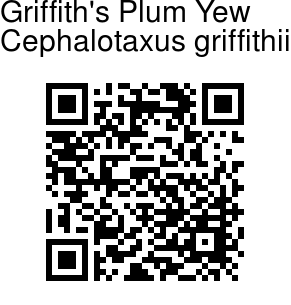 "Cephalo-taxus" means "head-yew," from the Greek "kephale" for head and the botanical name "taxus"for the yew genus. "Head-yew"refers to the flowering structures that are borne in tight clusters or "heads" and to its needles, which resemble those of yew. Another, more appealing common name, plum yew, refers to the plum-like shape and color of the ripened fleshy "cone."